I’d known Jane less than 24 hours when she told me a secret she’d been carrying around for months. She was driving me to see her Swiss doctor to take care of a bladder infection I’d had since I came to Europe six weeks prior. I was backpacking with three 18-year-old guys, and I was thirsting to speak to a woman—something, at 17, I had been too naïve to know I’d need during the three-month trip. But she was 20, and at the time, she seemed to me to belong to the world of adults, one where she had already learned hard truths about being a woman that I had yet to know. Her experience made me feel quiet and shy. “I don’t know why I’m telling you this,” she said, tears falling in streams down her face. “I just have no one to talk to.” It was too much to watch head on—I turned my head toward the windshield and trained my gaze on the quaint, storybook streets of Gingins, a small French-Swiss town where Jane worked as an Au Pair. The pedestrians on the sidewalk seemed solitary and distant, like Switzerland itself—apart and alone, austere in its pristine beauty, a country indifferent to the ugliness of Jane’s face as it cracked and then crumbled, her rosy cheeks becoming splotchy, her round face doughy, her eyes ringed with red. She was not a pretty crier. Jane had insisted I go to this doctor the moment I showed up on her doorstep, feverish and pale, a heavy backpack dwarfing my frame, three guys hulking around me. She’d gone to high school with Luke, the tallest and wildest of them, and the huge, luxurious house was our oasis after nearly two months of outdoor sleeping and surviving on baguettes and cheese. Though she was young, Jane looked like she had been engineered for motherhood. Her round cheeks always looked bitten with cold, and she wore her curly brown hair tied neatly at the nape of her neck. She favored jeans and bright sweaters that continuously rode up on her hips. There was a faint desperation in her sweetness, and it was almost painful to watch. Being an Au Pair seemed the perfect job for her, and I knew, from the moment I met her, that Luke wasn’t interested in this staid girl’s company. The attraction was the accommodations: a three-story home nestled among Switzerland’s mountains, which had everything we’d been missing for weeks—a full-stocked fridge, several hot showers, beds and couches, and a pristine kitchen. 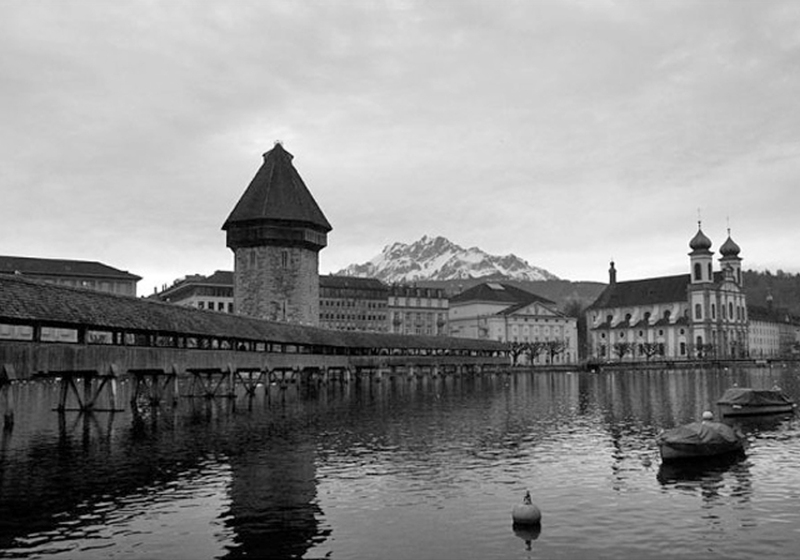 In the few days I’d been in Switzerland, its beauty had left me feeling cold. It seemed to slight me merely by existing, made me feel like a visitor it was only tolerating, and, to a degree, I understood the loneliness Jane must have been experiencing these last six months here. The couple she worked for was one of the richest families in affluent Gingins, and they lived in the biggest of the white houses that dotted the town’s streets. They worked as lawyers, had two blond children who looked just like them, and worked Jane as though she were a slave. They were out of town with their children, and this was the first few days she’d had off in months. When I first met her, she’d looked healthy and ebullient, but now that she’d let down her guard, the fatigue showed on her face. “I just feel…” she trailed off for a moment. “Totally alone. Have you felt like that?” She glanced over at me quickly, holding the steering wheel firmly as she began to regain composure, her knuckles white and taut. Did I? The question made me pause. Throughout the car ride, I had been vaguely, uncomfortably aware that her pain was reaching somewhere inside me and touching a place I had learned to guard in the last two months of travel. Is this what it felt like to be totally alone? Like all the available paths led to nowhere, a place only trumped in awfulness by here, exactly where I already was? Yes—I knew that feeling in a way I’d never had to know it before: down to the marrow, to the very architecture of my being, to the things that made me me. I had hoped to learn a lot of things on this trip, my first abroad, but the lonely reality of growing up, of being a woman among men – or a girl among boys – certainly wasn’t one of them. All of this had been my idea. After 17 years on this planet, all of them spent in California, the furthest east I’d traveled was Reno, where my grandfather worked the Keno and blackjack tables. My childhood world, which had felt cramped and limited, seemed to me a period of gestation, the waiting room of my life. I believed that the minute I got on a plane to Europe and turned on the world I knew, my life would really begin. And in a way, that turned out to be true. Or perhaps, this is truer: the safeguard of my adolescent dreaming gave way to hard truth. The first hard truth I learned: When you’re getting on a plane to a foreign country, don’t forget to pack the last-minute antibiotics you got for a sudden and painful bladder infection. And the second: when you realize you’ve left without them, don’t just grit your teeth and hope that your infection will go away. A three-month backpacking trip across Europe had been my dream, but my high school boyfriend, Jason, was game—and so were two of his friends. We worked full-time to save up for the trip while dragging ourselves through the last year of high school, and by the time June game around, we were all itching to go. Before we arrived in Gingins, the four of us had been traveling through France, Spain, and Italy, making up our itinerary as we went along, heading to small cities and towns where we could sleep outside. The night before our arrival in Gingins, we curled up in a sandbox in a Montreux park, one of our less ideal finds of the trip. When I woke at dawn to the sound of hushed voices, a group of men in black tossing giant duffel bags off the pier, I woke the others and we decided, frozen still in our sleeping bags, that it was time to get the hell out of the city and make our retreat. “I know exactly where to go,” Luke said. We had taken the train to Switzerland from the northern coast of Italy, where we spent two weeks sleeping on beaches, crawling under overhangs during summer storms, lightning etched across the night sky like a web of veins. We were broke, but not broke enough to forgo hostels all together. Sleeping outside was simply part of our – or rather, their – version of roughing it, Hemingway and Kerouac books hanging out of the sides of their backpacks, empty beer cans strewn around late night bonfires. It had all been my idea, but every day, that vision slipped a little further away from me, and I slipped further into their dream. Cathedral visits in northern Spain became free tequila shots; quaint hostels turned into freezing, empty beaches. I got sicker and sicker by the day. And lonelier and lonelier too. Because here are the next hard truths I learned: Don’t travel with a bunch of dudes, and don’t, under any circumstances, take an already fragile relationship and subject it to three months of exhausting travel. In the months before we left, my first relationship had developed its first fissures—the first jealousies, the first betrayals, the first unmasking, both to ourselves and each other, of just how mean we could be. When we reached London that first night, wandering the streets, looking to find a place to sleep, this thing we had been nurturing for the past year began to unravel at almost breakneck speed. Everything from then on was a fight—the price of a hotel room, whether or not we could afford a block of cheese, who got the key to let us in and out of the room. That first night in London, we clung to each other for warmth while we slept, our bodies fitting together like puzzle pieces. But as time went on, we moved apart, sleeping side by side, and then, eventually, back to back. I felt shut out of our relationship, so I tried desperately to be part of their clan, drinking whiskey straight, opening beer bottles with my teeth, and never letting on just how sick I was. In Cinque Terre, a rugged part of the Italian Riviera coast, we traveled between the region’s villages by foot, following dusty trails along the mountains above the coastline, acres of olive trees bowing under the costal wind, the small, white faces of cities peeking up at us from below. There were five villages in all, five beaches to sleep on. By the time we reached the fifth beach, tossing our bags on the ground, I thought I might cry when I saw it: not sand, not even pebbles, but hard, jagged rocks, a sea of painful edges. Why, oh why, rocks? Everything about it seemed deeply, profoundly wrong to me. For the first and only time on the trip, I begged. For the first time, I broke down and tossed aside the image of toughness I had worked so hard to create. Jason begrudgingly left with me for a nearby city, but when he saw the hotel prices, he got right back on the train to Cinque Terre. I was too scared to leave his side, and the return to the beach that night was my ultimate defeat – I wasn’t part of their world, and I wasn’t even part of mine. I struggled that night through a kind of half-sleep, tossing and turning between the chaos of bad dreams and the sound and sight of their bonfire, my fever at a high, hallucinatory pitch. When we finally reached Jane’s place in Gingins, I wanted nothing more than to sleep a deep long sleep. After Jane invited us in, I put my bag down at the foot of a big leather couch and collapsed onto it. The guys were already fishing around the cabinets, pouring what booze they could find into water glasses, and playing “Beast of Burden” like it wasn’t only four in the afternoon. Jane, who had disappeared to her bedroom, appeared at the foot of the stairs and beckoned me towards her. “Come on,” she said, pulling down her sweater over her hips. I got up and followed her lead, but I looked back at the guys for a moment before I went up, almost wistfully, as though, in climbing the stairs and leaving their party, I was leaving a world behind that I had worked so hard to gain entrance to. Jane led me to the highest floor. She had made up a bed for me, with a heating pad, some tea and a glass of water at the bedside. “I’ve made an appointment for you too,” she said. “I’ll drive you.” After she left, I lay down, curled up in a ball, and stared out at the mountains, a world that seemed too remote, too beautiful to touch. It almost hurt to be taken care of, I needed it so badly. I felt bad for thinking there was any desperation in her sweetness. Downstairs, Rolling Stones played loudly, and I could hear the clink of glasses, a hard and menacing laughter. In my sick haze, it seemed an underworld of danger, a nightmare I couldn’t quite wake myself from. I pulled the pillow over my ears, and thought of my parents seeing me off at the gate, how terrified my mother had looked, how excited my father had been, how ready I was to be free of them and everything I knew. We pulled into a tiny parking lot outside of the doctor’s office, a small, shingled building as quaint and adorable as the white houses that lined Gingins’s streets. The radio was on low, the French impossible to interpret. Jane eased into a parking space and put the car in park. “This doctor is really good,” she said, wiping at her tears. She took out a compact mirror and dabbed under her eyes, struggling to reconstruct the face she had on when I first met her at the front door of the home: wholesome, healthy, hopeful. “She’s the one who did the procedure for me.” She still hadn’t said the word out loud. She wasn’t going to say the word out loud. But she told me the whole story then, just minutes before my appointment: how the condom broke when her boyfriend from California visited during the holidays; how she wanted children more than anything in the world but was afraid; how her bosses made her go straight back to work when she got home, straight back to macaroni art and finger paints while she was cramping like hell; how she would’ve kept it if her boyfriend had wanted it. It reminded me of an embarrassing poem I’d written when I was 16 and attending a summer arts program where I had met the burly trio of guys I was traveling with. That summer, I think, was when I first felt it: that men had a certain kind of freedom I wanted. I wrote a poem with the start of each line repeating, “I wish I were a man,” and recited it to the other students, standing on the lawn where we held class outside, wearing a lavender top and a flower-covered skirt. I was too innocent then to even grasp the irony of that outfit. But on the Europe trip, I shed that soft skin, or at least that’s the story the surviving pictures tell, the one I wanted everyone to believe: me with my hair wrapped back into a handkerchief, my skin browned, my long hair knotted by the dirt and difficulty of travel. Me walking that coastal Italy trail, my backpack strapped to my back. One blazing hot afternoon on that trail in Cinque Terre, I was, for once, far ahead of the guys. An old couple passed me, and the woman pointed to me and said to her husband, “Look, honey, a real, live Amazon woman.” It was so far from true – I was 5’5”, 130 pounds, non-athletic by nature – but the moment meant so much that I snatched it up and have kept it this long, while so many other memories from that time have been lost. This trip was maybe where I first learned to pretend strength, to mask physical pain with an almost reckless gutsiness. In retrospect, travel often becomes the stories that feel worth telling, the narrative people want us to weave, and the others get lost in the mix. I showed my family and friends pictures of museums, boat rides, beaches and clubs where I partied. But I don’t have a picture of Jane. “Thank you so much for taking me,” was all I felt able to say. For all I had undergone in the past months, her pain seemed to dwarf my own. I couldn’t understand it. But I could see it, I could recognize it, I could choose not to judge it.